This antenna evolved during my search for a beam with a really great front-to-back ratio to use in hidden transmitter hunts. This design exhibits a very clean pattern and is perfect for RDF use. It trades a bit of forward gain in exchange for a very deep notch in the pattern toward the rear. (You could optimize the design for more forward gain, but at the expense of a really good notch in the pattern toward the rear.) It is a design that can be constructed using only simple hand tools (no machine shop needed) and still perform well. It has been duplicated several dozen times by other local hams and has been successfully used as a club construction project. When I designed this antenna I had one basic idea in mind. It had to be easy to get in and out of the car when hunting for a hidden transmitter. This would be accomplished by the use of steel "tape measure" elements. These elements could fold easily when fitting the antenna into my car and yet still be self supporting. I decided to use three elements to keep the boom from getting too long. Another of my design goals was to use materials that were easy to obtain. I chose to use Schedule-40 PVC pipe and fittings available at my local hardware store for the boom and element supports. These kept the cost for the antenna very low. The element supports consist of PVC crosses and tees. Since I had never seen any plans for an antenna using elements made from 1 inch wide steel "tape measure," I had to do the design myself. To assist in the design I used a shareware computer aided yagi design program written by Paul McMahon VK3DIP. It allowed me to optimize the antenna for the cleanest pattern combined with the best front-to-back ratio. When I first built this beam I found it needed a matching network of some kind to have a low SWR. My first attempt was a Gamma match. This was unwieldy. The driven element could barely handle the weight and the Gamma match itself was not very flexible. The best matching network turned out to be a "hairpin match." This is simply a 5 inch length of wire that is connected across the feed points of the driven element. The antenna has some capacitive reactance without the matching network. The 5 inch length of wire has just enough inductance to cancel the capacitive reactance. This resulted in a better match than anything else I had tried. The wire I used for the hairpin match was enamel insulated 18 gauge solid. Other hams who have duplicated this beam have used just about anything they had on hand. 14 gauge house wire works well, so does a length of 22 gauge hookup wire. It does not seem to matter if it is stranded or solid, use whatever you have available. This results in a very good match across the two meter band once you have adjusted the distance between the halves of the driven element for minimum SWR. (1 inch apart on my prototype). I used a pair of shears to cut the tape measure elements to length. An old pair of scissors will probably do as well. No matter how you cut the elements be very careful. Those edges are very sharp and will inflict a nasty cut if you are careless. Use some sandpaper to remove the really sharp edges and burrs resulting from cutting the elements to size. I put some vinyl electrical tape on the ends of the elements to protect myself from getting cut. I encourage you to do the same. It will probably be best if you round the corners of the elements once you cut them. Wear safety glasses while cutting the elements. Those bits of tape measure can be hazardous. The RG58 coax feedline is connected directly to the driven element. No matter what method you use to attach the feedline, make sure you scrape or sand the paint off the tape measure element where the feedline is attached. Most tape measures have a very durable paint finish designed to stand up to heavy use. You do not want the paint to insulate your feedline connection. If you are careful, It is possible to solder the feedline to the element halves. Care must be taken since the steel tape measure does not solder easily and since the PVC supports are easily melted. You might want to tin the tape measure elements before mounting them to the PVC cross. If you decide not to solder to the tape measure elements, there are two other methods that have been used to attach the feedline. One method employs ring terminals on the end of the feedline. The ring terminals are then secured under self tapping screws which hold the driven element halves. This method does not allow you to tune the antenna by moving the halves of the driven element. 6-32 bolts and nuts could be used if holes are drilled in the elements near the ends. If the bolt heads are placed nearest the PVC fitting, you could secure ring-terminals with nuts and lock washers. Another possibility is to simply slide the ends of the feedline under the driven element hose clamps and tighten the clamps to hold the ends of the coax. I know this is low-tech, but it works just fine. Stainless steel hose clamps are used to attach the driven element halves to the PVC cross which acts as its support. This has the added benefit of allowing you to fine tune your antenna for lowest SWR simply by loosening the hose clamps and sliding the halves of the driven element either closer or further apart. By using the dimensions specified, I found that the SWR was 1:1 at 146.565 Mhz (our Fox-Hunt frequency) when the two elements were spaced approximately 1 inch apart. Figure 1 shows the method used to attach the driven element to the PVC cross. I used 1 1/2 inch hose clamps to attach all the elements on my prototype beam. Others who have duplicated my design have used self tapping screws to attach the elements to the PVC crosses and tees. Performance is the same using either method. The screws are much less expensive but they do not hold the elements as securely. If you do not use 1/2 inch PVC fittings but instead use 3/4 inch, make sure the hose clamps you buy are large enough to fit. If you wish a slightly neater looking beam, use the self tapping screws. If you do not mind spending a few more dollars for the hose clamps, use them instead. If I were to build another beam I would use screws for the director and reflector, and hose clamps for the driven element. That would give me the best of both methods. Rubber faucet washers have been used by some builders between the tape measure element and the PVC fittings on the director and reflector. These allow for the tape to fit the contour of the PVC fitting and will make the antenna look better. Now you know what to do with those washers left over from the assortment you once purchased; You know the ones I mean, the washers that do not fit the faucets you have in your house. If you are an apartment dweller, ask around, these things are stashed in almost every homeowners basement or garage. Cut a length of tape measure to 41 3/8 inches. It will be the Reflector element. Cut two lengths of tape measure to 17 3/4 inches. These will be used for the Driven element. Cut one length of tape measure to 35 1/8 inches. It will be used for the Director. Once you have cut the tape measure to length, put vinyl tape on the cut ends to protect yourself from the sharp edges. You will want to scrape or sand off the paint from one end of each of the driven element halves so you can make a good electrical connection to the feedline. If you are planning to solder the feedline to the driven elements it is best to tin the elements first before attaching them to the PVC cross. If you don’t, the PVC will melt as you apply heat to the element. It would be a good idea to also take the time to form the wire used for the hairpin match into a “U” shape with the two legs of the “U” about 3/4 inch apart. Tin the ends of the hairpin if you plan on soldering it to the driven element. If you tin 1/4 inch of each end of the hairpin it will leave 4 1/2 inches to shape into the “U”. You will need to cut two lengths of PVC pipe to use as the boom. One should be cut to 11 1/2 inches. It is used to form the boom between the Director and the driven element. The other piece of PVC should be cut to 7 inches. It will be used between the Reflector and the Driven element. Just about any saw will cut through the soft PVC pipe. I used a hacksaw. When we mass produced this antenna as a club project, we marked the pipe and used a portable jig saw to cut the lengths in assembly line fashion. It took longer to measure the pipe than to actually make the cuts. Since the pipe is available in ten foot lengths, you can make a few beams from a single 10 foot length. In any case, you might want to cut a few extras lengths for your friends. They will want to duplicate this once they see your completed antenna. At this time you can pre-assemble the PVC boom, crosses and tee which will support the tape measure elements. I did not use any cement or glue when I assembled mine. The PVC pipe is secured in the fittings with a friction fit. The hose clamps I used are stainless steel and have a worm-drive screw which is used to tighten them. They are about 1/2 inch wide and are adjustable from 11/16 inch to 1 1/2 inch diameter. Attach the tape measure elements to the PVC fittings as shown in the accompanying drawing. It is normal for the Reflector and Director elements to buckle a bit as it is tightened to the PVC Tee and Cross. You can eliminate this buckle if you use the washers and self tapping screws to attach these elements instead of the hose clamps. I do not think the beam will withstand as rough a treatment as when hose clamps are used. How does the tape measure beam "measure up?" 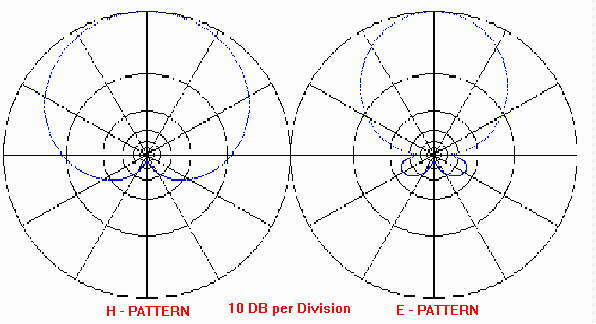 WB4SUV and WA6EZV used a storage scope connected to a copy of this antenna constructed by KC8FQY and provided the following picture of the actual antenna pattern. I am very happy to see that the computer prediction of a clean pattern with a really great front-to-back ratio was accurate. What do you think? Summary This beam has been used on Fox-Hunts, on mountain tops, at local public service events, outdoors, indoors in attics, just about everywhere. The SWR is typically very close to 1:1 once adjusted. Front to back performance is exactly as predicted. The null in the rear of the pattern is perfect for transmitter hunts. When tested using a sensitive field strength meter and a low powered fox transmitter, full scale readings were seen from a distance of ten feet. With the same field strength meter I was able to point the antenna away from the transmitter and move the reflector element to within a few inches of the transmitter antenna and still not see a reading. I don’t have the facilities to verify a 50 db notch as predicted by the Yagi-Cad software but It sure seems close. The flexible elements have taken a lot of abuse. My antenna has seen a lot of use and has held up quite well. Best of all, when on a fox-hunt, this beam is a breeze to get in or out of the car.